Since spring has officially sprung all that seems two things tend to overtake high schoolers minds… spring break and prom. The later of which is especially fun to dress for. I have received quite a few emails in the previous weeks asking for me to scavenge the internet and round up some of my favorite picks for prom dresses, the perfect procrastination method if you ask me. Lucky for y'all I found so many great picks that would be perfect for prom and countless other spring events such as formals, easter, weddings, and just about anything else. Different schools do prom differently and at my school we wore long dresses however many of the requests I have been receiving are for short dresses. Now looking back and having multiple sorority formals under my belt and thinking I would rewear my prom dresses I wish I had known about Rent the Runway. I have yet to rewear my prom dresses and while it is great to have them around "just in case" most people pay too much to have them sitting in their closet all this time waiting for an opportunity to rewear them to arise. I'm sure most of you have heard of Rent the Runway before but if not you basically pay an extremely discounted price to rent one of their many designer dresses to wear for your event. So many of my friends swear by Rent the Runway for every sorority function we have and they are always the ones with the coolest dresses. You keep the dress for 4 or 8 days depending on which time frame you choose and then you ship it back. I specifically recommend this if you are planning to wear a long dress since short dresses are easier to wear more frequently. And since short dresses are easier to wear I fully support you splurging a bit (but don't tell your parents I said that). Mixing up jewelry and shoes can completely change the look of an outfit and believe me if you're not rewiring it one of your friends will. I can guarantee that first hand considering how many formals and functions some of my dresses have made it to. If I were going to prom and wearing a short dress I would hands down be wearing this dress and dressing it up with a fun necklace like this one (please someone wear this combo so I can live vicariously through you). I have gathered dresses from all over the internet and compiled them below, it's as easy as clicking on the dress you love and being able to instantly shop away! 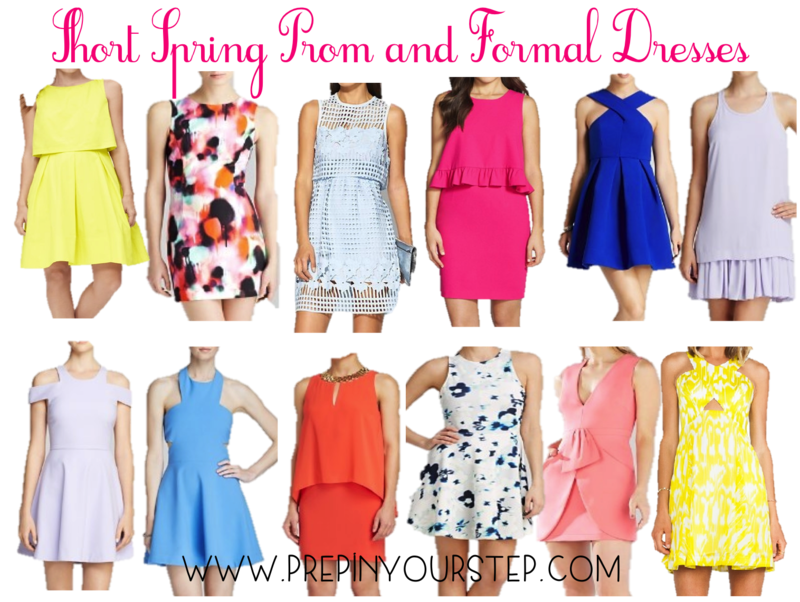 And if you can't tell from my picks, I highly encourage going bright and bold, why wear blank to a spring formal? Shop these dresses and many more below and be sure to let me know what dress you'll be wearing for any fancy events you have coming up in the near future! Love all of the adorable dresses! Oh this makes me wish i was still in high school again, these dresses are so cute! I wish I had known about Rent the Runway in high school too! It would have saved my parents a lot of grief... I love your dress picks! Love all the dresses - some could work for greek life events as well! When I saw my wedding dress at first sight, I began to love it very much. I tried my first dress on. I felt it was so special for me.